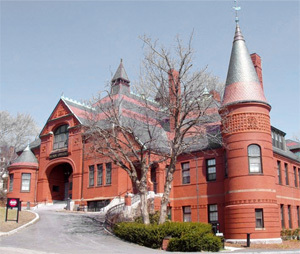 Settlement in the area that now includes Belmont began in 1630, when Sir Richard Saltonstall and approximately 40 families separated from the first settlers of the Massachusetts Bay Colony and moved inland to start an agricultural community. Originally called Pequosette after the local Indian tribe, the name of the new town soon changed to Watertown. In 1638, by order of the General Court, Watertown paid the Pequosette Indians the sum of 13 pounds, 7 shillings and 6 pence for the land. The original settlement spread inland extensively into the present towns of Watertown, Waltham, Weston, Lincoln, and parts of Cambridge and Belmont. In 1738, Waltham seceded from Watertown, and the future Belmont was now part of three towns. In 1805, Frederick Tudor began cutting ice on Fresh Pond. As his business grew, he decided to build a railroad from his wharves in Charlestown to Fresh Pond. This line was built about 1843. With the railroad so near, the citizens of Waltham clamored to have it extended to their village which was granted and the line ran through what was to become the Town of Belmont. The railroad made the purely agricultural community available for residences of well-to-do Bostonians. Settlements centered around Wellington Station (now Belmont Center), Waverley Station, and Hill's crossing station. Those settlements grew into villages, but local government arrangements were annoying because citizens had to go to Watertown, Waltham, or West Cambridge (now Arlington) to vote and attend town meetings. A group of about 1,000 people joined together in the early 1850's and announced their desire to form a separate town. One of the most enthusiastic advocates was John Perkins Cushing, the largest taxpayer of the proposed town, who gave generously and openly to the incorporation expense on the condition that it be named after his 200 acre estate "Bellmont." The towns of Watertown, Waltham, and West Cambridge fought the proposed creation of a new town, but in the end the battle was won and on March 18, 1859 the Town of Belmont was born. Of the then total area of 5 square miles, 2.26 were taken from Watertown, 0.67 from Waltham, and 2.82 from West Cambridge. The population was 1,175 of whom 170 were registered voters and 325 were school children. The new town was a widespread collection of fruit farms and market gardens. Produce from Belmont farms was sold at Faneuil Hall market. Specialties included celery, tomatoes, cucumbers, berries, and small fruits. In fact, "Belmont" became a term of distinction indicating quality and large size. The original town included a part of present day Cambridge including half of Fresh Pond. Because of a controversy over a slaughter house erected in Belmont on the banks of the pond which was the drinking water supply for Cambridge, 0.89 square mile of Belmont was annexed in 1880 to that city. This left Belmont with a total area of 4.676 square miles. Minor adjustments due to various Route 2 widenings makes the total area 4.655 square miles today. entirely residential and is known as "The Town of Homes."